Can you get to socialism by camel? This question is chosen by academic Sarah Cameron as a chapter title in her newly published book on thefaminethat devastated Soviet Kazakhstan in the early 1930s.Sultanbek Khodzhanov, a Soviet Kazakh official later shot in Stalins purges, quipped during heated debates about how communism was to be implanted in a land roamed by nomads and their herds that you cant get to socialism by camel! As Cameron illustrates in detail, this tension between the self-reliant, freewheeling lifestyle of the Kazakhs and the controlling, modernization agenda of the Soviet regime led not only to mass starvation but also to the total eradication of a way of being that had existed on the steppe for millennia. In doing so,The Hungry Steppe: Famine, Violence and the Making of Soviet Kazakhstanoffers a valuable contribution to the historical record by providing the first painstaking, English-language examination of the Kazakh famine. The story of the Ukrainian famine of the same period has an established and expansive bibliography. Some accounts, like Anne Applebaums Red Famine, have even earned prominent perches in main street bookstores. The tragedy that befell the Kazakh people, meanwhile, has fallen between the cracks of history. Unlike Ukraine, whichcharacterizesthe events of the 1930s as a genocide and wields them as a form of political and moral pressure against Moscow, the Kremlin-allied elite in Astana is more circumspect inits treatment of the Kazakh famine. As The Hungry Steppe shows, these stories are parts of a single greater narrative. To this end, Cameron, an assistant professor of history at the University of Maryland-College Park, documents how the starvation that struck Kazakhstan in 1930 had common causes with the famine that hit Ukraine and southern Russia in 1931. The key factor was the collectivization of agriculture. In the late 1920s, the regime of Joseph Stalin corralled the rural population, along with their property and animals, into collective farms, even if those farms had not yet been built or were ill-equipped to function. Stalin ordered mass requisitioning of food stocks to feed urban workers driving his industrialization program. For Ukrainian and Russian peasants in the breadbasket of the Soviet Union, this meant grain seizures. For Kazakh herders, it meant the confiscation of their livestock. This led to the eradication of 90 percent of their herds. Collectivization was an economic and humanitarian catastrophe across the Soviet Union, Cameron writes, but nowhere were its effects more disastrous than in Soviet Kazakhstan. In addition to collectivization and requisitioning, the Kazakhs faced a third element: forced settlement of the nomads. The communists saw this as the crowning glory of their social-engineering project to transform backward Kazakhs into modern Soviet people. The architects of this vision disregarded ample warnings about the unsuitability of the difficult and arid terrain for mass farming. The link between collectivization and requisitioning and the Soviet famine is well-established. But Cameron takes a deep dive into the background that set the scene for mass hunger in Kazakhstan. Drawing on archival sources and Kazakh- and Russian-language materials, she details the changes to nomadic lifestyles in the latter years of Russian Imperial rule that laid the ground for upheavals after the Soviets came to power. This was a time when an influx of Slavic settlers was displacing Kazakhs from their roaming grounds. Cameron also provides accounts of the heated debates of the 1920s, like the one that prompted the joke about socialism and camels. Could a nomadic lifestyle be incorporated into the Soviet mainstream? Or was the Kazakh way of being incompatible with communism and, accordingly, destined for obliteration? Kazakh functionaries were divided into two camps. A leading champion of the nomadic lifestyle was Akhmet Baytursunuly, who argued that Kazakhs had no need to construct communism because they already practiced it in theaul.The Kazakh village was a prime model of collectivism small groups of families roamed together and shared property. Baytursunuly would in 1937, at the height of Stalins purges, be executed for harboring bourgeois nationalist sentiments. Others, like Smagul Sadvakasov, argued for settling the nomads, but said this should be pursued gradually, over decades. In the event, neither of those cases would win out. It was decreed that nomads should be settled, and fast. The decision set Moscow on a collision course with the recalcitrant Kazakhs. The objects of this grand experiment started fleeing en masse to escape the collectivization and livestock requisitioning that began causing hunger in the late 1920s. Filipp Goloshchyokin, who then ran Soviet Kazakhstan, had launched his Little October policy a blitzkrieg of industrial and agricultural reforms that wreaked havoc across the steppe. 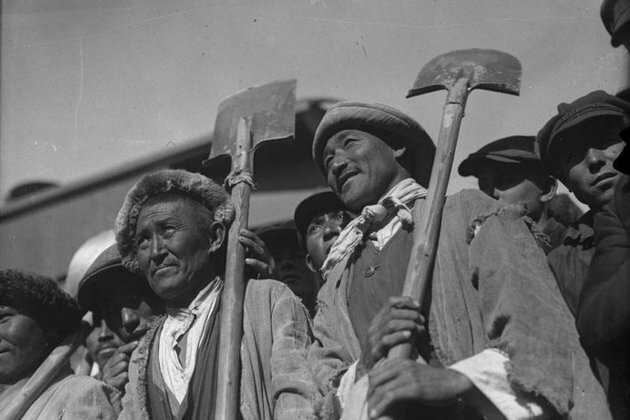 Far from bringing about sedentarization, the program to settle the Kazakhs sparked mass migration, as hungry nomads moved from famine-stricken areas in search of food into other parts of the Soviet Union or abroad, mainly across the border into Chinese-controlled Xinjiang. Cameron provides deeply affecting accounts of starving nomads roaming in search of food. Victims faced anything from expulsion from Soviet cities to arbitrary execution at the hands of border guards on the Chinese frontier. For the regime, escapees were little more than traitors to the communist cause class enemies and counter-revolutionaries deserving of death. The Kremlin received ample warning about collectivizations potential to cause hunger and a stream of information about starvation when the famine began, writes Cameron. Moscow not only failed to moderate its policies, but instead sent new streams of settlers into Kazakhstan, putting even greater pressure on food supplies. As Cameron points out, any serious assessment of the collectivization era acknowledges that the Kazakhs were by far the most intensely affected Soviet ethnic group in proportionate terms. The death toll in Ukraine is estimated at somewhere up to 4 million, out of a pre-famine population of 33 million. This weakens claims by those Western and Ukrainian scholars who argue that the regime in Moscow doled out particularly brutal treatment to the Ukrainians because of their history of nationalist resistance against Russian rule. Cameron writes that even though the Kazakhs did not have such a troubled relationship with Moscow, there is still little to distinguish the regimes brutal response to the Ukrainian case from that of the Kazakh case. So, was the Kazakh famine a genocide? Cameron says that there is no evidence that Stalin set out to destroy the Kazakhs as a people. But if we rely on the original 1944definitionof genocide, which is described as the intent to destroy the essential foundations of the life of a group, the case looks stronger. Through collectivization, Moscow sought to destroy nomadic life, a key feature of Kazakh culture and identity, writes Cameron. And the Kremlin was ultimately successful. As The Hungry Steppe persuasively documents, the famine did not just culminate in the extermination of one-quarter of the Kazakh population and the escape of millions more it also wiped out the lifestyle of the Kazakhs forever.